The medicinal uses of ginger have been well-known by herbalists for over 2,000 years, and modern science is still taking advantage of the many ginger properties to treat diabetes, high blood pressure, and nausea, among other common ailments. By examining the history of its use, it is clear that ginger has many health benefits. However, it is also important to understand ginger nutrition when incorporating it into your diet. Here, you will find the most prominent ginger root vitamins and their benefits. This is a water-soluble vitamin that is stored in the body in very limited amounts. All excess vitamin C is excreted through urine. Because of the limited amounts that your body retains, it is important to incorporate vitamin C in your daily diet. Vitamin C acts as an antioxidant, has healing properties, aids in collagen formation, and is also key in helping to absorb and metabolize other nutrients. Ginger contains two different forms of vitamin B. The first, vitamin B3, also known as niacin, is water-soluble and not stored in the body. It is important to eat B3-rich foods in your everyday diet because this vitamin helps your body make energy from fat, proteins, and carbohydrates. The second B vitamin present in ginger is vitamin B1, also known as thiamin. This vitamin is also important in helping your body to utilize proteins and carbohydrates to make energy. While ginger is often used in cooking for flavoring foods, it should be noted that the B and C vitamins in this herb are sensitive to heat and can be destroyed during the food preparation process. These ginger root vitamins can also be damaged by prolonged storage or exposure to light. In order to reap all the benefits of this Asian root, eating fresh, raw ginger is highly recommended. Ginger in its raw form contains 5.0 mg of vitamin C per 100 g, 0.025 mg of vitamin B1 per 100 g, and 0.75 mg of vitamin B3 per 100 g. For men over the age of 18, approximately 90 mg of vitamin C is recommended on a daily basis, while women are recommended to consume 75 mg.
For your daily dose of ginger root vitamins, supplement with other foods and herbs that are rich in vitamins C and B. With respect to vitamin B1, adult men are recommended to consume 1.2 mg daily, while adult women should consume 1.1 mg. Daily recommendations for vitamin B3 is reflected in 16 mg for men and 14 mg for women. These dosages may vary if you are pregnant or breastfeeding. 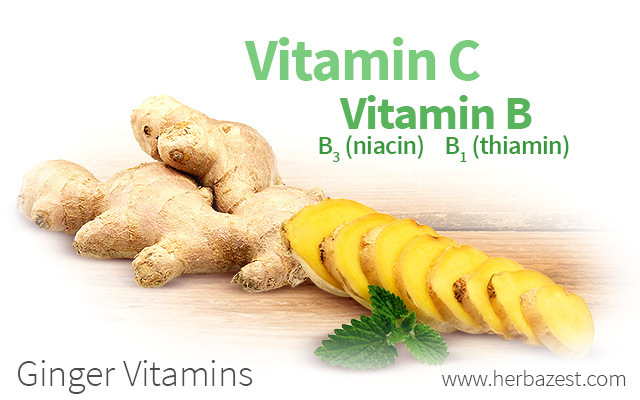 While ginger does contain vitamins C and B, other common herbs are richer in the same important vitamins. For example, chamomile and rose hip are significant sources of vitamin C. However, these herbs are most commonly taken as infusions, and it is important to note that heat may deplete much of their vitamin C stores. Camu Camu, on the other hand, is considered the best known source of vitamin C, beating oranges with about 30 times more ascorbic acid content. Considering the significance of B vitamins in helping your body produce energy from fats, carbohydrates, and proteins, as well as the role of vitamin C as an antioxidant, it is important that you are receiving the correct doses of these vitamins daily. Taking into account the many other ginger health benefits, this wonderful root deserves to be considered as a tool for maintaining good health.